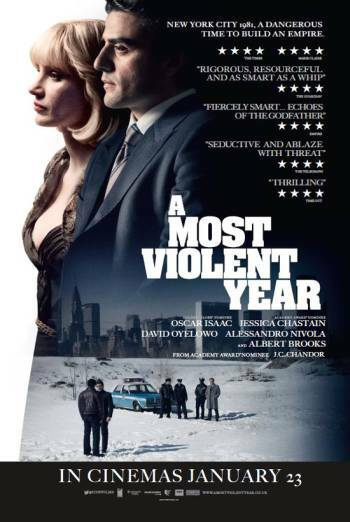 Summary A MOST VIOLENT YEAR is a US drama, set in New York City in 1981, in which a young businessman tries to establish himself in the heating oil distribution business without resorting to crime. A MOST VIOLENT YEAR is a US drama, set in New York City in 1981, in which a young businessman tries to establish himself in the heating oil distribution business without resorting to crime. There is a single use of very strong language ('c**t') and over thirty uses of strong language ('f**k'). There are three scenes in which male characters are pistol-whipped and/or punched; in another scene, a character places the barrel of a self-loading pistol beneath his own chin and pulls the trigger. There is a large spray of blood and more blood begins to pool beneath his head after the event. However, there is no discernible injury detail.